What functionality does the GP3 include? This is common question that we see all the time and we’d like to share that info here with everyone. 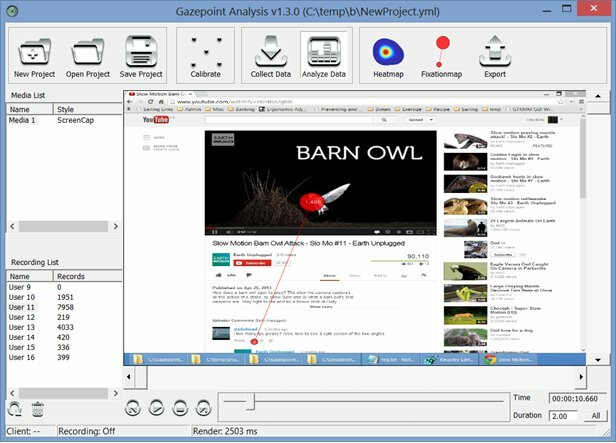 The GP3 includes Gazepoint Analysis which is an easy-to-use usability study analysis software. It can produce heat maps and gaze fixation maps overlayed to either screen content (web pages, images, video, custom software). Comparable software from competitors cost anywhere from $500 to $10000. Screen capture allows you to capture whatever content is on the screen, images, video, webpages, custom software, etc., and record both the screen images and the gaze data. The gaze data may then be visualized as scan paths or heat maps and exported as images, videos, or raw comma-separated-values for further analysis.